Development firm Related Cos. is awarding a contract to demolish a 60,000-square-foot building as part of work on the West Side rail yards, above. Seeing green shoots in the New York City office market, development firm Related Cos. is stepping up early work on a massive project planned during the economic boom over the West Side rail yards by the base of the Javits Center. This week, Related is awarding a contract to demolish a 60,000-square-foot building on the property once used as metal products distribution center. It is clearing a development site for what Related hopes will be the among the first post-recession office towers to be built. Related is talking to about a dozen possible tenants, says Jay Cross, who is leading the rail-yards development for Related. The company is under pressure to get moving, given its agreement with the Metropolitan Transportation Authority, which owns the 26-acre rail yards. The agreement calls for the developer to begin paying hefty rental payments once an improving office market hits an availability rate of 11% availability rate. It is currently 12.6%, down from 15% a year ago. "The efforts we are undertaking ensure we are ramped up and ready to go because it's hard to predict exactly when you are going to hit on your first and second tenant deals," says Mr. Cross. "This market is very diverse when it comes to large users, and the market seems to be very resilient." Related is focusing its planning on starting a 1.4 million-square-foot building on the southeast corner of the rail yards that would have up to 1 million square feet of office space, topped with 25 floors of apartments, according to Mr. Cross. This 800-foot-plus tower would sit on firm ground, while the rest of the site requires an expensive roof to first be built over the tracks. Like many developers, Related plans to effectively give away the office space at cost to a major tenant—asking for rents of about $70 a foot—while it would look to make its money on the residential above, Mr. Cross said. The site has long been a priority of the Bloomberg administration, which sprinkled tax abatements on the property, and the city is funding an extension to the area of the No. 7 subway line, currently slated to be completed in 2013. But it remains an open question among real-estate people whether a large tenant would make the jump to the unproven far West Side. "Anytime soon I'd say it's low-probability," Robert Freedman, chairman of brokerage Colliers International's New York office, said of the project. "I think the fundamentals will be solid, but it's going to take a while." 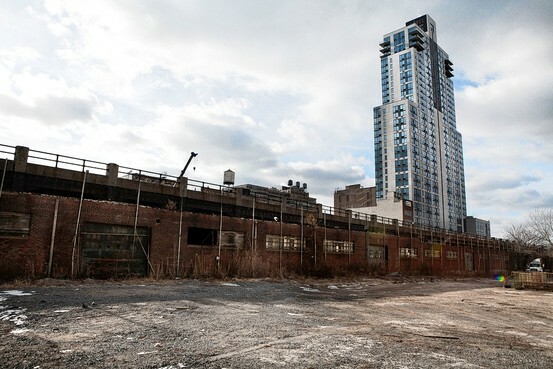 The eastern portion of the rail yard is an approximately 13-acre site located between West 30th and West 33rd Streets from 10th to 11th Avenues. The ERY was rezoned in January 2005 to accommodate approximately 6.6 million gross square feet of mixed-use development, including office, residential, hotel, retail, cultural and parking facilities, and public open space. The zoning controls for the site require approximately 7 acres of public open space, including a significant public plaza. Additionally, it is anticipated that development of the ERY will include a major new cultural facility. The High Line connects to the southern edge of the site. It was reported a few weeks ago that the New York-based, handbag/shoe maker, Coach, is negotiating with Related for 600,000 sf of space in a new tower at the Hudson Yards. Stephen M. Ross's Related Cos. has a leathery catch on the line for its planned Hudson Yards development project -- New York-based luxury goods maker Coach, Inc.
Sources told us booming Coach is prowling for up to 600,000 square feet of office space on the West Side for a new corporate home. "Coach has been exchanging paper" with Related regarding Hudson Yards as well as with other landlords in the area, the sources said. Publicly-traded Coach was founded here in 1941. Its leather bags, accessories and other products are sold at 400 stores in the US and Canada, including eight in Manhattan. But few shoppers know that Coach is also a big office-space user. The company owns its 265,000-square-foot headquarters building at 516 W. 34th St., which it once used for manufacturing and where it still maintains a small factory to produce samples. It also has a few hundred thousand square feet at 450 W. 33rd St. and at a smaller building on 34th Street. "Now, they've outgrown their premises," a source explained. There's no letter of intent for Hudson Yards, at least not yet. But a source described the Related talks as "still a work in progress but very serious." Financially strong Coach currently has around $1 billion in cash on its balance sheet to play with. The 26-acre Hudson Yards site bounded by 10th and 12th avenues between West 30th-33rd Streets -- most of it above the West Side rail yard -- is to be developed by Related and OMERS, the Ontario Municipal Employees Retirement System. Last May, Related signed a deal with the MTA to lease the site for 99 years, with the partners putting in a $21.75 million deposit. The project is eventually to include 21 million square feet of development. The master plan calls for three corporate headquarters sites, 5,000 apartments in nine buildings, "destination" retail, a luxury hotel, a new public school, cultural facilities and 12 acres of public open space. It was understood last night that Coach and Related weren't focused only on one of the office sites, but were exploring "options" at all three. The MTA/Related deal is contingent on several economic-climate yardsticks. As is typical of such public-private arrangements, it's full of escape clauses and trap doors allowing either side a way out. Moreover, Related must first build a platform over the tracks. But Related has said previously that with a tenant, work could start as early as 2012. And, if history proves anything, nothing can get a huge project off the ground -- and make all the issues go away -- like a tenant commitment. Yeah, that was posted over in the Hudson Yards thread. I'm sure they're one of the dozen potential tenants, and i'm not surprised by any of it. Related is talking to about a dozen possible tenants, says Jay Cross, who is leading the rail-yards development for Related. Meanwhile, here's the "illustrative" rendering of the railyards development. It can be misleading, because the buildings actually haven't been designed yet. But what it does is give a window into how the development is planned to be built out. However, the buildings shown are on the lower end of the spectrum, not a true indication of the potential height of the towers. to give a better representation of potential heights. And here's the rendering with the location of the first office tower to be built marked, which will be on the eastern yards. Sweet development. I wish we had that here in T.O. I especially like those two neo-Deco towers in the front and the modernist slab to their right. The glass towers? Not so much. From that last rendering it shows how this will be a city within a city. "I'm going there, but I like it here wherever it is.."
I hope they would design a 2000ft supertall as a signature tower for the Hudson Yards Project. It would have been nice to have a distinctive supertall buuilt there that would break through the skyline, Oh well. I'm not hoping for a 2000 foot tall building, but something with a little more vision then this. At least a "signature office tower." The ones proposed now are uninspiring and just plain dull. The residential buildings look fine to me, and I'm glad they differ (at least conceptually). Practicality is more important to the developer and tenant rather than building a trophy. What's the giant turd pyramid building that I think MTA has to do with as well as the NYP if I'm not mistaken? Is there no plan to redevelop this building? Has to be one of the worst structures in all of Manhattan. Haven’t heard any revitalization plans about this building; I doubt anything is in the pipeline. The good news is that it’ll be buried with all the new development surrounding it. I see. Yes, it would've helped had I actually read the post first. That tower has zoning for 3.1 million square feet of space, and will eventually be redeveloped. A few years ago, the previous owners (Monday Properties) floated a couple of designs that included a massive tower above the existing structure.